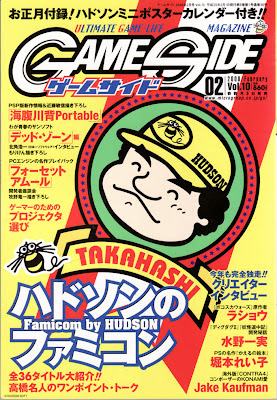 Today I discovered GameSide - a Japanese retro-focused magazine. Today I also discovered that it is closing, and the August issue on sale is now its last. Mainly I’m cribbing information from Keving Gifford’s painfully good Game Mag Weaseling column, and injecting my thoughts regarding Retro Gamer magazine, which I was freelance and then staff writer on, and also the UK games mag industry. I learned the other day that Japanese mag GameSide is closing up shop with its August 2010 issue, which went on sale a couple of days back. 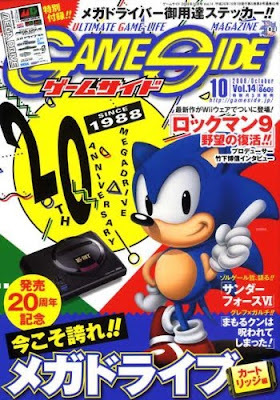 Devoted largely to Retro Gamer-style coverage of older games and interviews with game designers of the past, the mag had survived two name changes and about 14 years of constant publication before finally giving up the ghost. 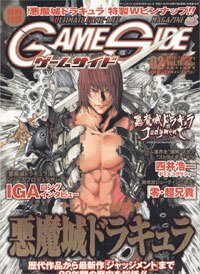 GameSide began life in 1996 under the title Used Games, an A6-size (105mm x 148mm) mag that was published on a seasonal basis. 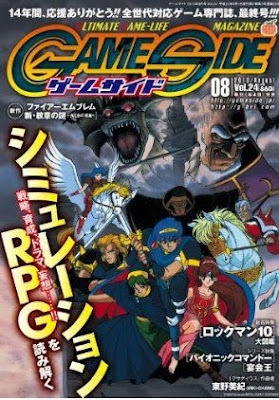 It was part of a small wave of A6 game titles that debuted in Japan during the mid-1990s, spearheaded by editors from Kadokawa Shoten and other large publishers who wanted to write about games without suffering under the advertiser and reader demands of a mainstream outfit. This alone makes it sound like an amazing place to work. I’ve often blogged and written about my dislike for working on UK videogame magazines, mainly since they’re run by unpleasant people, while the downtrodden staff suffer from excess work and severe underpay (below minimum wage in some cases), which forces them to do unethical things. In fact I wrote a scathing multi-page rant on this, revealing everything, but then I came to my senses and didn’t publish it here. I will though, someday. Another thing I hate about UK magazines is how shackled they are to publisher advertising, and the whims of PR people whose bonus pay is based on Metacritic scores. PRs will make life difficult if you jeopardise their bonus pay by giving low scores. Publishers like Konami will pull advertising from as many as a dozen magazines if just one of those magazines scores one of their games less than what’s demanded. The idea of a Japanese magazine saying ‘to hell with that’ and doing its own thing, based on what the staff want to do, without having to suffer PR politics, publisher blackmail, or reader demands, sounds so unreal, so incredibly painfully idealistic, I don’t actually want to believe it. Because it would mean that what I went through as a writer, what everyone in the UK is going through right now, doesn’t have to be like that. There are viable, alternative market models that could support such magazines, probably with decent staff salaries. The UK’s CEOs I’m sure know this, but why change a good thing when you’re swimming in money and your workers don’t complain, eh? Refusing advertising? Oh god, Kevin Gifford’s magical words makes me want to weep. Advertising, bribery, corruption, blackmail, and alcoholism-inducing underpay for staff is chronic, so endemic in the very being of UK games mags, that it wouldn’t be possible to function without it. Used Games' beat wasn't strictly retro stuff; it was a bit more nuanced than that. Its editors were more interested in simply finding obscure, fun old releases, the sort of games that fell through the cracks of mainstream media coverage, and giving them the push they deserved. It was written for the kind of guy who liked spending afternoons going up and down the game-shop aisles, thumbing through CD cases and trying their luck with something they hadn't heard of before -- the thrill-of-the-hunt sort of gamer. This approach continued with remarkably little change through the years, as Used Games changed names to YuGe and finally GameSide in 2006. Another fascinating revelation, since one of the depressing things for me about writing for Retro Gamer were the orders from my editor and CEO to create a fuzzy blanket of nostalgia for the majority of our readers. 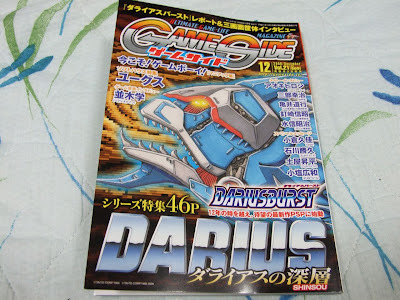 Sure, I wrote the occasional bit of obscure coverage, such as on fan-translations, import titles, Tec Toy, and a few tiny snippets of news coverage on Japan’s Comiket and the UK’s beat-em-up tournaments. But these were always ghettoised and it was always with much effort on my part. The most horrendous example was when I pitched something for news, and was told: “No, you can’t write about that, no one knows what it is. Cover that topic they’re all discussing on the forums.” As if a news item on a topic which was hot 30 days ago is going to encourage people leafing through the magazine to buy it. I thought the whole point of news was to cover stuff no one knew? The overall belief was that the core Retro Gamer readership, which generated most of the revenue, was only interested in nostalgic pieces that talked about their favourite games - regardless of whether it said anything new. Retro Gamer does have lots of Making Of articles, which sometimes bring something new to the discussion, but so much of the internal conflict when I was there was over management trying to shoehorn in more retreads of already well covered topics, against my desire to document the unknown. On my last issue I used TIGsource as a reference for homebrew game news, and arranged our homebrew section to have coverage of really cool, retro-themed and obscure indie releases. It was incredible. I would have wanted that level of intense coverage every month. After I left the mag, the indie section became abysmal, never making the most of its potential and without fail, missing lots of and lots of cool homebrew releases each month. Another thing that bugged me is the way obscure stuff is handled. The Import Only section, which covers niche imports, is crippled by a ridiculous need to show a single screenshot detailing 3 unique aspects about the game. To which I ask, what if there aren't 3 unique things about it? What if it’s just a really cool game, but is similar to a whole bunch of others? Then there's the fact you need to have a boxout on similar games which are cheaper and more expensive, plus other nonsense. Is that how GameSide covered retro and obscure titles which it was trying to champion? I doubt it. I left after 6 months in-house because the psychological abuse from upper management, plus my pathetic £12,000 a year salary and sometimes 60-hour work weeks made me hate absolutely everything - but the blinkered approach to coverage also contributed to my leaving. Good thing, really, because in doing so I doubled my salary and halved my workload elsewhere, and started to appreciate life again. I'm a much happier person as a result. Reading about GameSide moves me, because the magazine is portrayed as representing everything I wanted to see as a games journalist. Freedom from publishers and advertisers, and the freedom to document things previously undocumented. Real journalism, as some might put it. Actual, honest-to-god reporting, involving research and digging up old documents and bringing to light forgotten knowledge. A bit like what Derboo did with his Korean history feature on HG101, and what Talbain talked about on his blog. 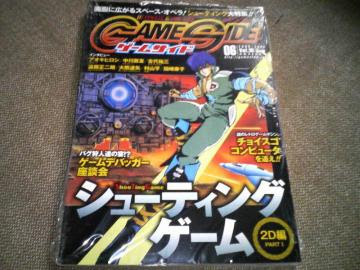 Furthermore, it saddens me, because I never had a chance to discover GameSide when it was around. What magical gems did it cover before folding? What incredible features did it run? By it disappearing before having had a chance to experience it, GameSide will now forever exist in my mind as being immaculately and impossibly perfect - the sum of all my desires and more laid out as and more so than I could have imagined. Kevin Gifford talks about living in Japan 12 years ago and browsing the Tokyo flea markets while reading GameSide, and while I try to imagine this, and what those pages possibly contained, my lingering thought is that nothing my mind can invent will ever compare to the actual magnificence of what it was at the time. 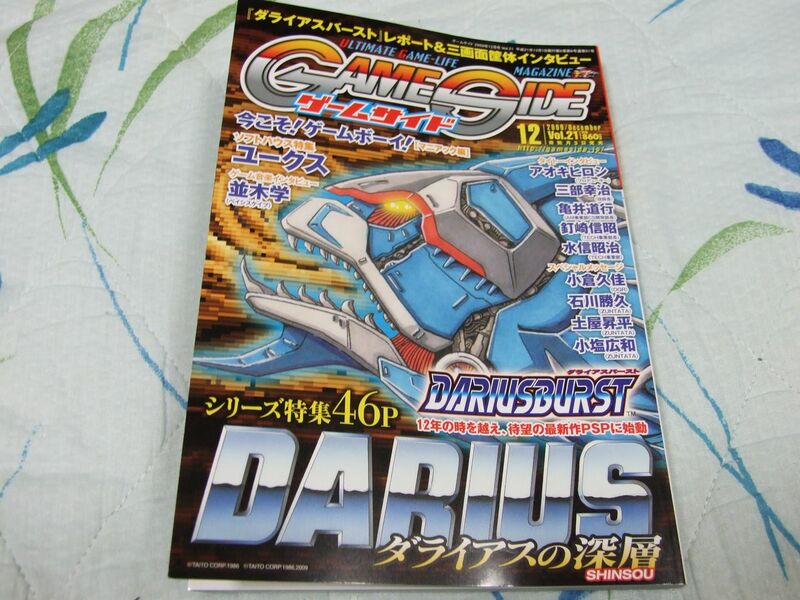 I wanted to buy this last issue of GameSide, but I can’t find anywhere online that sells it. The official website seems to link to some kind of store, but I’m not sure if I can buy the magazine from there. Play Asia and Yes Asia don’t stock it. eBay is dry, except for older issues. AmazonJP has it, and while the mag only costs £6, the postage is around £30! Which is far too rich for my blood. Do any readers have any suggestions for buying it? If older issues are on Ebay,this one gonna end up there as well,just be patient mate.. I saw this in the bookstore the other day. This is depressing news. 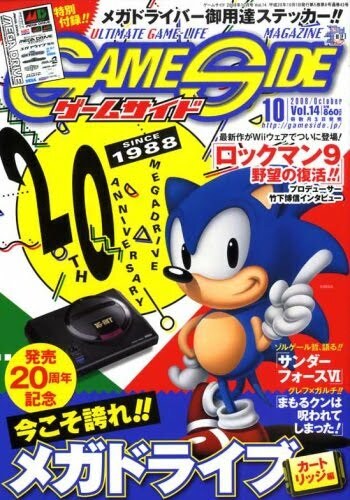 Gameside was a terrific mag. 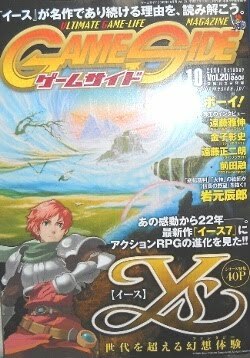 Their 4-volume history of the Japanese RPG, compiled by Gameside editors, is magisterial. For what it's worth, thank you for your thoughts on Retro Gamer. I discovered the magazine recently and was initially quite enthusiastic about it. However, my interest mainly involved the "Making of" articles and whatever bits of gaming history they see fit to showcase. I feel a little worse for having picked up a copy knowing what you and others there have endured. However, I know of no other gaming magazine that provides the kind of coverage that Retro Gamer provides in the United States. Furthermore, withholding my money would only hinder the writers and not the company bigwigs who make the decisions. It's a zero sum game in my eyes. £12,000 a year? That is ridiculous. Not surprised you quit. Full time editors are on between £17k to £20k per year, a bit more at Future publishing based on what an editor told me, but not much. I think EDGE's editor has a bit higher, but that's speculation on my part. Game Mag Weaseling is awesome! Interesting Post. It is fascinating to read about the problems of being a staff writer, I'd be very interested to read that lengthy expose you wrote if you ever get around to publishing it! 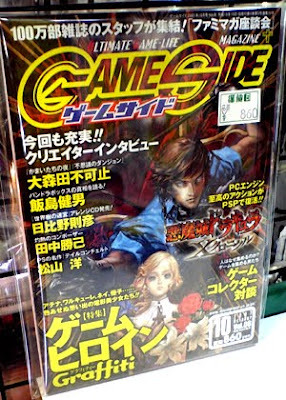 About GameSide, my travels often take me to both retro game stores and used book stores in Fukuoka and I have added it to my list of things to look for. I'll let you know if I do!